Yes, it's real! 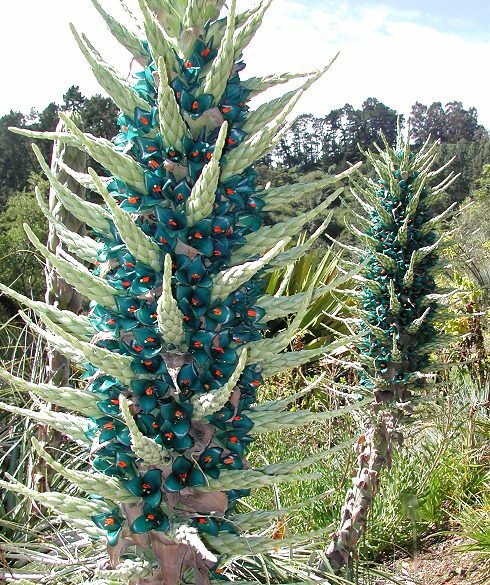 From Chile comes this amazing Bromeliad, the Blue Puya - Puya berteroniana. With its massive, 7 foot tall flower stalk, this is one of most outrageous plants anywhere. Its turquoise-blue color is very rare in the plant world, and it's even rarer to be combined with orange. If you like shockingly beautiful plants, you'll want to add this one to your collection! 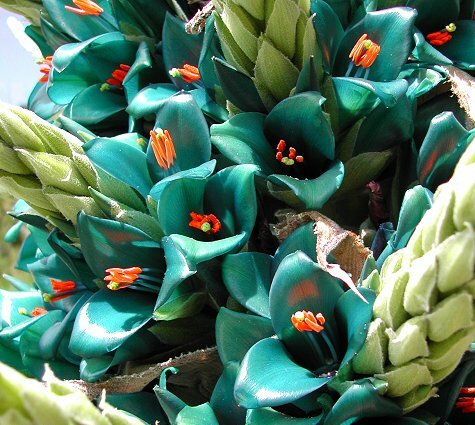 The Blue Puya is a terrestrial Bromeliad that is related to Pineapple. The plant forms a rosette of silvery-green leaves about 3 feet long. The leaves are spiny, so move carefully around the plant. The flower stalks themselves are soft, and the flowers are silky-smooth. These other-worldly blooms appear around May or June. It's an unforgettable experience to stand next to one of these massive, blue stalks. The blooms are pollinated by birds, which love to sit on the outward-pointing tips and drink the nectar inside. 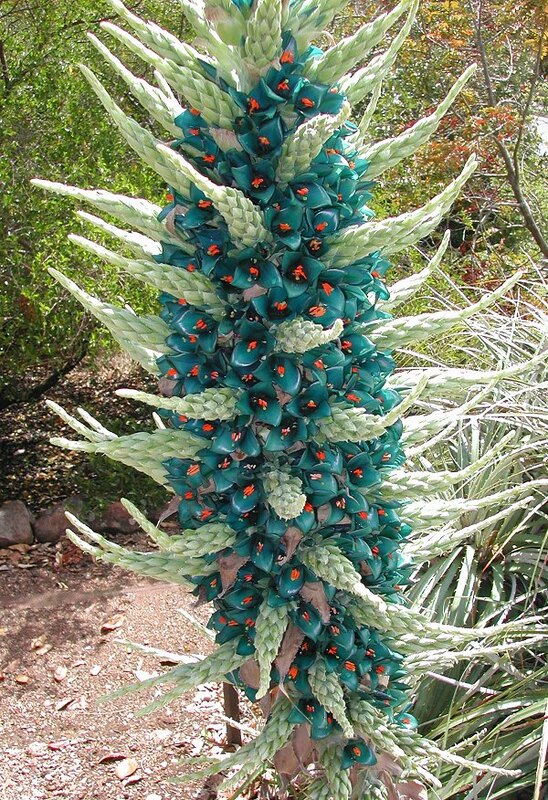 The Blue Puya has bluer flowers than my Turquoise Puya (below), which has more of an emerald tint. They are both the same species, but come from different parts of Chile. The outward tips of this blue variety are thicker and whiter, which makes the flowers look even bluer! It's hardy to zone 8b-11. Mature plants are said to survive temperatures down to about 20 degrees F (-7°C), but younger plants should be protected from frost the first 2 or 3 years. It enjoys sun, but in warmer climates it might appreciate some afternoon shade. It comes from a cooler climate, so consider it experimental in hot climates. Unlike the tree-dwelling Bromeliads, it has fully-functional roots and grows in soil, much like a cactus or succulent. Eventually it will form a large colony of pups. 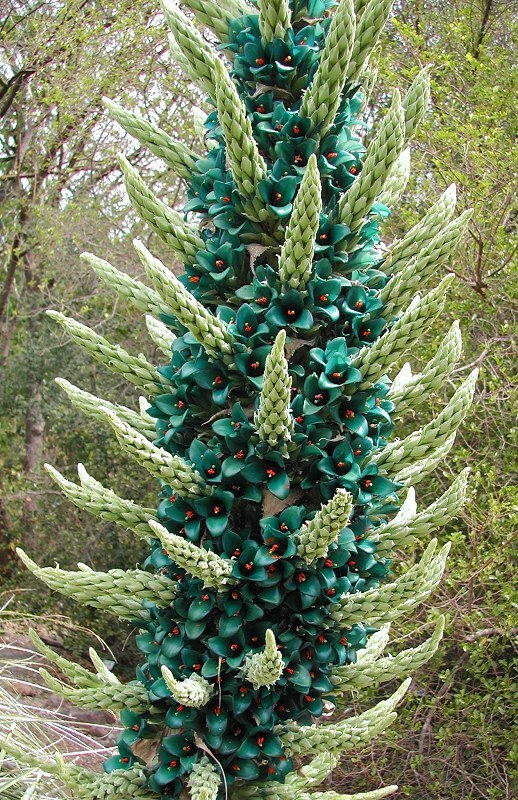 Be patient with Puya, as it can take 6-8 years to reach flowering size. Your patience will pay off when you witness the mind-blowing colors of this incredible plant! This species is rare, and if you can find it, it's sometimes a similar species, Puya alpestris, mislabeled as Puya berteroniana. Alpestris is a smaller plant, with shorter, less impressive clusters. Also, fake Puya seeds have recently emerged from China. 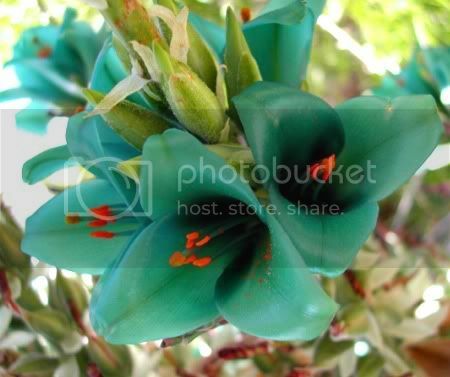 This is the genuine Blue Puya berteroniana!